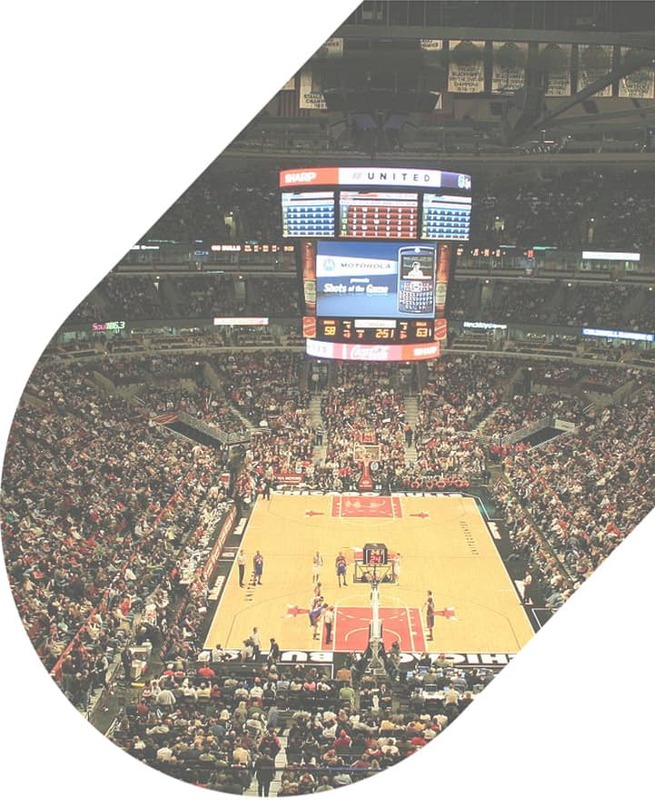 Whether you’re a Chicago basketball fan, an ice hockey fan, or just planning to attend a major concert, you can rely on National Charter Bus for all of your transportation needs to the United Center. Get your tickets to see the Chicago Bulls with a group of your favorite people and we’ll take care of the driving to the arena. With a private motorcoach and a professional driver from National Charter Bus, you can travel together with your friends, family, and colleagues before enjoying a big game. Party it up on a comfortable charter bus before you arrive at the stadium and celebrate Chicago’s victory to the fullest once the game is over. We have your group transportation covered from beginning to end. Give us a call today at 312-392-0239 to get the rental process started! The United Center stands as the largest professional stadium in the country in terms of physical size. Compared to other sports stadiums, the United Center doesn’t quite boast an impressive seating capacity but has still offered visitors a memorable experience. It has served as the base for the famed Chicago Bulls basketball team since its opening in 1994. Famous players like Michael Jordan and Scottie Pippen have called the United Center home over the years. 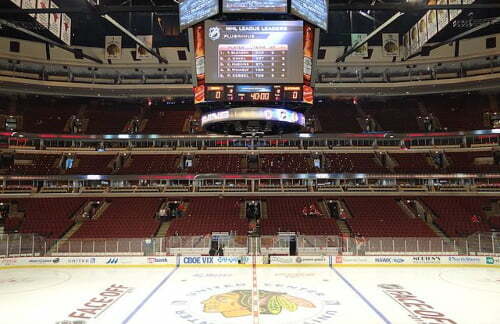 The Chicago Blackhawks moved into the stadium in 1995, making the United Center truly a home to champions. As one of the oldest teams in the NHL, the Blackhawks have ranked among the most successful teams in the league’s history. Along with being a venue for the Bulls and Blackhawks, the United Center also hosts major concerts and other sporting events like nationally-broadcast UFC fights. Popular artists like U2, Bruno Mars, and Adele have graced the United stage, bringing in thousands of visitors to the venue. The stadium offers a variety of seating options, including VIP suites with clear views of the arena for games and concerts. 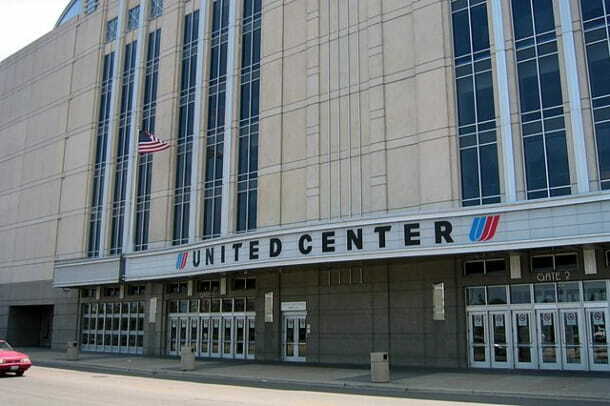 Located on Chicago’s Near West Side neighborhood, the United Center is about 3 miles from Chicago’s downtown area. 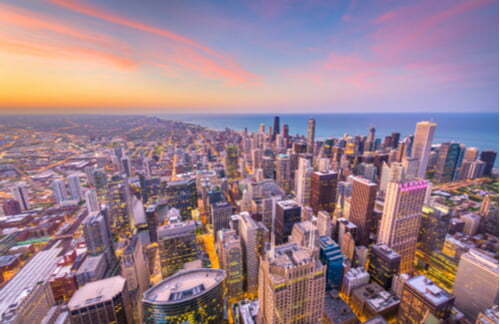 Similar to other major cities, Chicago is notorious for its infamous traffic. If your group is traveling from out of town to attend an event at the United Center, be sure to put on your patience caps when making your way to the stadium. A measly 3 miles in Chicago can turn into quite the hike during peak travel season. Many Chicago visitors choose to stay near Miracle Mile and popular attractions like Millennium Park to get the best views of the city. Getting from locations around Chicago to the United Center with a group of fellow Bulls or Blackhawks fans can be a tedious task. Whether you’re local fans or out-of-towners, renting a charter bus is an easy solution to simplifying the group travel process. Don’t worry about group members arriving late after traveling in separate vehicles or getting lost when attempting to find parking near the center. A private motorcoach rental from National Charter Bus will eliminate the stress associated with parking because you’ll have a professional driver to handle that for you! Everyone will travel together, so friends and family members won’t get lost in the throngs of vehicles around the stadium. Relatively small groups of fans can choose from an 18-, 20-, or 25-passenger minibus to comfortably transport everyone to the United Center. These compact buses may not be as large as full-sized coaches, but they’re perfect for squeezing through traffic-laden roads. Bigger groups planning to attend an event with a community organization or even a school would be best suited with a full-sized coach to transport as many passengers as possible. No matter the model of bus that you choose, you’ll be able to make your trip smooth and simple with National Charter Bus. Enjoy a climate-controlled bus with reclining seats, WiFi, televisions with DVD players, on-board restrooms and more while we handle the transportation. On-site parking at the United Center is available in advance for personal vehicles while buses and oversized vehicles must pay upon arrival at designated lots. Lot B is specifically designated for buses and is $40 per vehicle, compared to $22 to $29 for cars. Street parking is available in the neighborhood surrounding the center but often fills up quite quickly. Regardless of the parking situation at the arena, your driver will navigate the hectic parking lot for your group so everyone can focus on getting hyped to cheer on the Bulls or Blackhawks. Get there early. This advice is usually a given for most large-scale events, but it’s always important to give yourself extra time when traveling with a group. Gates open an hour and a half before game time. Arrive at least an hour before the game so you can enjoy the stadium and get settled. Stadium meals are expensive, so grab food and libations beforehand. Although outside food and drinks are not allowed in the stadium, there are plenty of places near the stadium to enjoy. Check out Billy Goat Tavern or try Giordano's famous pizza at its nearby Greektown location. Don’t forget the Michael Jordan statue. If you arrive at the stadium early, you’ll give your group more time to get pictures with the iconic Michael Jordan statue outside of Gate 7. The statue is very popular with visitors, so be sure you swing in for photos as soon as possible. Inquire about group tickets. Groups of 25 or more can take advantage of ticket discounts for select Bulls games, while groups of 10 or more can inquire about Blackhawks tickets. Discounts may not be applicable for top games of the season, but it’s definitely worth an inquiry for large groups. Reconsider your seating preferences. This tip fully depends on the type of event you’ll be attending at the United Center. While many sports fans enjoy the 300 level seating for great views, these seats may not be the most practical for concerts. Keep in mind, the United Center is primarily a sports arena, so the sound quality may not be the best for musical events. Our rental experts are available around the clock to assist you in finding the best charter bus for your trip to the United Center and around Chi-town. Even if you’re traveling from other Midwest cities like Indianapolis, Detroit, or Cincinnati, National Charter Bus will take care of all your travel needs. Call us at 312-392-0239 to receive a no-obligation, personalized quote for your Windy City trip.